The First Parish of Watertown, established in 1630, is one of the oldest parishes in America. 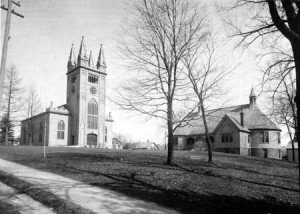 The First Parish of Watertown is one of the oldest congregations in the United States. Puritans, who were seeking religious freedom in England, left there in 1630 on a flotilla of ships with the Arbella as the flagship for the fleet. A model of the Arbella can be found in our sanctuary. It also serves as a symbol of our long history and advocacy of freedom, and can be seen on our newsletter and church banner. Those Puritan immigrants arrived in the New World to found three communities, and their respective churches. These were Charlestown, Boston, and Watertown, the first inland community in the Massachusetts Bay colony. In Puritan times every resident was required to belong to the geographical parish and pay taxes for its support. 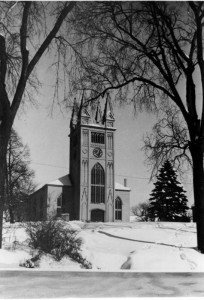 The Watertown congregation gained a reputation for non-conformity very early in its history when its first minister George Phillips said that churches other than Puritan ones were legitimate congregations, and residents of the community affirmed a revolutionary rallying cry of no taxation without representation. Our present Congregational form of church government owes its foundation to these Puritan times, where the members of each congregation, in democratic fashion, have authority over property ownership, membership rules, and the call of the minister. The First Parish of Watertown has worshipped in eight different meetinghouses since 1630. The first building was constructed near present day Mt. Auburn Hospital in Cambridge, where the original Watertown settlement was located. Subsequent meetinghouses included sites at the corner of Arlington and Mt. Auburn Street, on Hillside St., at the top of Common Street, and then in 1755 a fifth building was erected at the bottom of Common Street on Mt. Auburn Street. This structure became the meeting place for the Provincial Congress during the American Revolution, when Watertown was the capital while Boston was occupied by the British. The four cornerposts of this meetinghouse can be seen in the Common Street Cemetery. The sixth, seventh and eighth buildings have all been located near the corner of Church and Summer Streets. 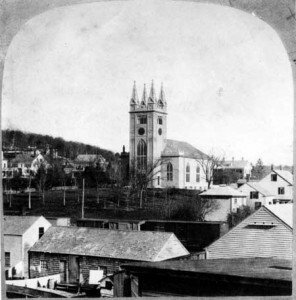 After the separation of church and state in 1833, the old Parish Church was required to separate from the town, and it built a new church, now officially Unitarian, in 1836. This structure burned and was replaced in 1842. In 1889, the church built a new parish hall called, The Unitarian Building, designed by Charles Brigham. 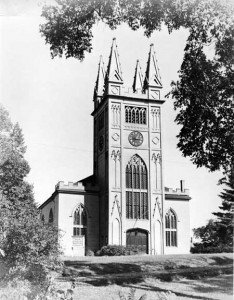 This building was converted into a church, when the old wooden Gothic building (1842) was torn down in 1975, after the church had declined in numbers. In recent years (1996 and 2003), capital fund drives have enabled the congregation to construct an accessible addition to the building with an elevator, and more recently install structural steel supports and remodel the sanctuary to ensure the preservation of this historic structure. Known for non-conformity in its early years, the First Parish of Watertown was guided into the Unitarian faith during the ministry of Convers Francis. Francis was active in the Transcendentalist movement, and a friend of Ralph Waldo Emerson. He became the mentor of famed preacher and abolitionist, Theodore Parker, who taught school here in Watertown. Francis sister was the abolitionist and writer Lydia Maria Child, who is best known for her Thanksgiving poem which begins, Over the river, and through the wood . .. Francis was followed in the ministry by John Weiss, another abolitionist preacher. Weiss was one of the first theologians to follow a scientific naturalism for his faith. He was also the founder of the Free Public Library of Watertown. 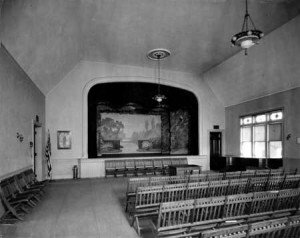 The 20th century brought many demographic and religious changes to Watertown, and the congregation declined, while the meetinghouse fell into disrepair. Thanks to the work of Helen Robinson Wright and others the congregation refused to die. Wrights memory is preserved in a fund that assists non-profit organizations and individuals in need. One of the better known ministers from the 1960s, David Rankin, helped revive the church, and also hid draft dodgers in the parsonage attic during the Vietnam War. In the meantime the Unitarians consolidated with another liberal religious movement, the Universalists, in 1961. After the present meetinghouse was converted from a parish hall, the congregation experienced slow but steady growth. Much of this was achieved after the church called its first woman minister, Andrea Greenwood in 1992, who later served as co-minister with her husband and our present minister, Mark Harris. The congregation celebrated its 375th anniversary in 2005 in a beautifully refurbished sanctuary.Below are links to two papers that Mark Harris presented at conferences: The first is on the early history of Watertown and Congregational polity; the second is on Convers Francis and John Weiss, and some of their contributions to the UU movement. Charles Brigham biography by David Russo. First Parish offers a variety of programs to respond to individual spiritual needs. Our church building is an accessible facility (via the parking lot – Summer Street entrance). Orientation classes for newcomers are offered in the Fall and Winter. Information about all of our Programs is available in our Newsletter, the Arbella. Our congregation belongs to the Unitarian Universalist Association (UUA) and the UUA New England Region. Unitarian Universalism has no creed. It affirms the worth of human beings and advocates freedom of belief and the search for advancing truth. Adult classes and support groups are offered on a regular basis. Our Social Action Committee sponsors a monthly Giving Box where parishioners have the opportunity to contribute to a variety of local social service organizations. Our Adult Choir, Youth Choir, and Children’s Choir provide further opportunities for participation. The First Parish of Watertown is a Welcoming Congregation. We welcome and celebrate the presence and participation of lesbian, gay, bisexual and/or transgender people in every aspect of congregational activity. Worship services are held every Sunday morning at 10:30 am from September to June in our Sanctuary. Our services last about one hour and fifteen minutes. Dress is informal. Lay-led services are held during the summer months starting at 9:30 am. The first fifteen minutes of the service includes our weekly announcements, a musical prelude, our opening rituals and chalice lighting, and a time for all ages. Children remain with their families for the first few minutes of nearly every worship service. After that, they are invited to attend age-appropriate Religious Education classes. Services are followed by social hour downstairs, where you can enjoy coffee, refreshments and conversation. I have long been fascinated by the power of ideas, and how certain “truths” get inside our heads and remain there as gospel, even if they contain only a kernel of truth. I suppose it is a kind of “fake news,” but it is also the source of many of our prejudices. Think how socialism has been associated with totalitarianism, making it easier for most people to dismiss it as subversive. How much does the power of an idea have a hold on you? Registration for the 2018-19 Church Year is now open! Click the button below to fill out this year’s registration form. Classes for all ages center around a story and include questions to help children and youth explore their own ideas and the ideas of their family, culture, and faith more thoroughly. Most classes do an art project, music, or drama activity that connects to the story and discussion. Classes end at 11:55 with clean-up and a closing ritual. This Sunday, January 6, is an Episode Sunday. Most classes will watch an episode or hear an excerpt of the pop culture elements their curricula are based on. We start a new theme today: Animals and Caring for Earth’s Creatures. Music at First Parish engages our community and adds a spark to every listener and participant! As part of weekly church services, we share in singing hymns. Services are enhanced by either piano or guest musicians who express a wide variety of styles that include Classical, folk, jazz, ethnic and world music, as well as popular music and music composed by contemporary artists. Those artists are often part of our congregation or friends from the musical community in the Boston area. First Parish has an adult choir that rehearses weekly and sings at a church service once per month. We have a full rock and roll band that plays at some services, too! Recently, the choir sang with the band for an extraordinary service! There are times that our music director hosts a family choir event, usually on multi-generational services, in which people learn the music prior to the service and then share the songs at that service. We have a wide variety of talent in our congregation and have had some wonderful youth and children singing at church services. Instead of the annual caroling that our community does each year, our choir will be singing a Madrigal concert that will ignite our holiday spirit. FPW Spring Potluck – at 6:00pm.